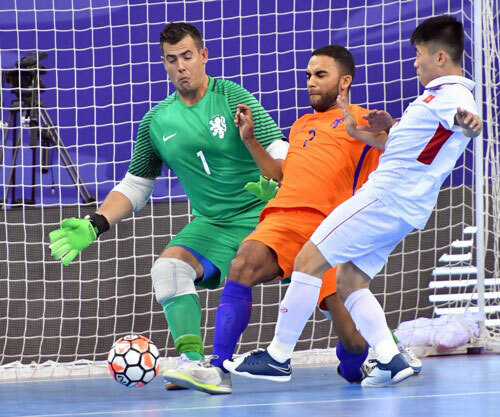 The team tied 2-2 with the Netherlands in the final match to rank third with four points after three games. Croatia took the title, while the Netherlands came second. Earlier on October 21, Vietnam beat China 4-3. Vietnam controlled the game in the first few minutes. Nguyen Minh Tri opened the score for Vietnam in the 13th minute. However, just nearly a minute later, Zhang Liang levelled the score for the hosts with a penalty kick. In the 15th minute, receiving a pass from Liang, Liu Wenxi helped the host lead 2-1. Two minutes later, Co Tri Kiet levelled the score at 2-2 for the visitors. Kiet’s goal was a driving force for the visitors who played aggressively in the second half, and Vu Quoc Hung proved himself with a goal early in the half. In the 27th minute, with a spectacular and skillful kick, Xu Yang helped his team to a 3-3 draw. In the remaining time of the match, the visitors played with more focus. Quoc Nam fixed the score at 4-3 in favour of Vietnam. The tournament was held by the Chinese Football Association. It attracted the participation of China, Croatia, the Netherlands and Vietnam. The event was a warm-up game for Vietnam team to prepare for the AFF Futsal Championship, HDBank Cup 2017, to be held at Phu Tho Gymnasium in HCM City from October 26 to November 3./.